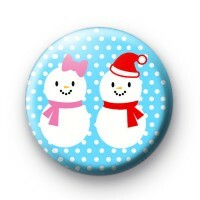 How fun and festive is this blue Mr and Mrs Snowman Badges? It is so cute and nothing says Christmas quite like a little snowfall. We have everything crossed for a white Christmas. Our Festive Badges make thoughtful handmade gifts and are nice to give out to Teachers, students and friends and they are also great little Christmas Party Favours too!